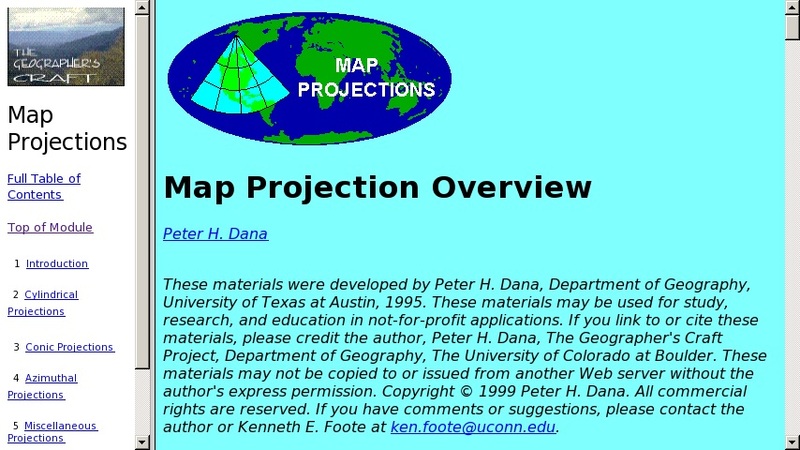 This site offers descriptions for each of the major map projections now in use. The author treats each type of projection in detail and each explanation has a scientific illustration depicting a visual conception of the projection. Cylindrical projections discussed include cylindrical equal area (Behrmann, Gall's stereographic, and Peters), Mercator, Miller cylindrical, and oblique and transverse Mercator. Pseudocylindrical projections include Mollweide, Eckert, Robinson, and sinusoidal projection. The Conic projections discussed are Albers equal area, equidistant, Lambert conformal, and Polyconic, while azimuthal projections include azimuthal equidistant, Lambert azimuthal equal area, orthographic, stereographic. Some other miscellaneous projections are also discussed. This site includes links to related sites.